Visitors who need to contact First Direct Arena in Leeds can find out how to reach them on this page. The main helplines are open all week for enquiries and bookings. Find out more before attending events here. Leeds was previously one of the only major cities in the UK without an arena to host large events. In 2013, First Direct Arena opened. The name comes from First Direct bank, who are sponsoring the venue until at least 2023. The arena is purpose-built in a fan shape so all the seats are facing the stage. This means that seats further away are still closer than in other arenas with four sides of seating. The maximum capacity of the venue is 13,500, or 12,500 for seating-only events. The first act to ever play at the arena was Bruce Springsteen. Since opening, the arena has hosted a variety of shows including music, comedy, and sports. Contact First Direct Arena any day of the week on the following helplines. Got a question about First Direct Arena in Leeds? Can’t seem to find the answer online? Simply call them on 0844 248 2347 to speak to a member of staff at the arena. They can answer your questions and point you in the right direction. You might want to know about the seating plans or food and drink options. You should double-check the increased security rules for what you are not allowed to bring inside the arena. This will help you to avoid any issues or disappointment on the day of the event. They can advise you on your options for parking. Door opening times and stage times may not be available until the actual night. Call 0844 248 2348 to book tickets for an event at First Direct Arena over the phone. Please note that for popular events the lines will be very busy. This means long waiting times are likely, so tickets may sell out if you are on hold. Tickets are also available online from approved ticket websites. Eventim is First Direct Arena’s official ticketing partner. Ticket prices and seating availability will vary depending on each event. You should check the arena seating plans to make sure you buy the right tickets. Transfer to the helpline for Accessible Tickets from Monday to Friday. The Accessibility booking line only opens from 9am to 5pm. The leading charity for disabled inclusivity, Attitude Is Everything, awarded First Direct Arena the Silver level of the Charter of Best Practice. 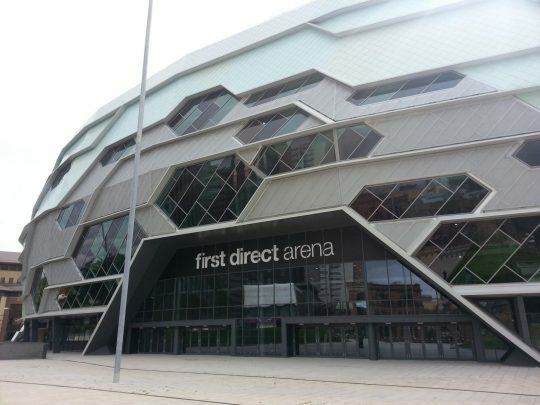 Call 0844 248 2349 to speak to the Accessibility co-ordinator if you have any concerns about visiting First Direct Arena. This is not the Accessibility Tickets booking line. Call to ask about accessible parking, entrance points, lifts, seating, and toilets. If you have extra requirements such as bringing an assistance dog or special medical needs, call to learn how First Direct Arena can assist you. To make any enquiries about the facilities, you can also send an e-mail to accessibility@firstdirectarena.com. First Direct Arena is an excellent venue for entertainment, conventions, exhibitions, and conferences. It can host from 2,200 to 12,000 square metres of exhibition space. There are luxury rooms for functions as well as many versatile spaces. The main auditorium can accommodate a banquet for up to 1,100 people. The Black & White Lounge is best for smaller meetings and receptions. The arena can offer organization of the entire event with Saville’s creative team, from floor plans to set design to digital interactivity. If you want to hold an event at First Direct Arena, call 0844 248 2351. Discuss your needs to find out how they can help. If you’re going to see one of the world’s most famous acts here, you can make the experience even more special. First Direct Arena offers luxury suites for up to 16 people, perfect for pre-show conversation or dining. Guests use the VIP entrance and lift and have a clear view of the stage. Businesses who regularly entertain clients can make use of the annual hospitality memberships. There is a members-only lounge, plus suites with private bars. These are accessible even on non-event days. Call 0844 248 2352 for more information about hospitality services at First Direct Arena. Get assistance with booking your upgrades. First Direct Arena is the host of many entertaining events. If you do not have a positive experience at the arena, call 0844 248 2353 to complain. You can pass on any general feedback if there is something which the arena should change. Maybe the prices or the food availability are not satisfactory. Or you could have problems with the seating, such as lack of legroom. Were the lighting, ventilation, or acoustics of a terrible standard during your visit? How do you feel about the lack of a cloakroom or Wifi in the venue? If the staff or security treated you badly, then let First Direct Arena know so they can address the issue and apologize. Whenever in-demand tickets go on sale, the phone lines become very busy. If you have a quick query but can’t get through on the phone, you have other options. Check Facebook or Twitter for any updates that might answer your question. Tweet directly to @FDArenaHelp if you can’t find the information you need anywhere. You can also e-mail the teams at social@firstdirectarena.com. The primary e-mail address for general enquiries is info@firstdirectarena.com. Contact lisa.turton@smg-europe.com with any enquiries about advertising options. If you would like to work at First Direct Arena, check out the vacancies online.